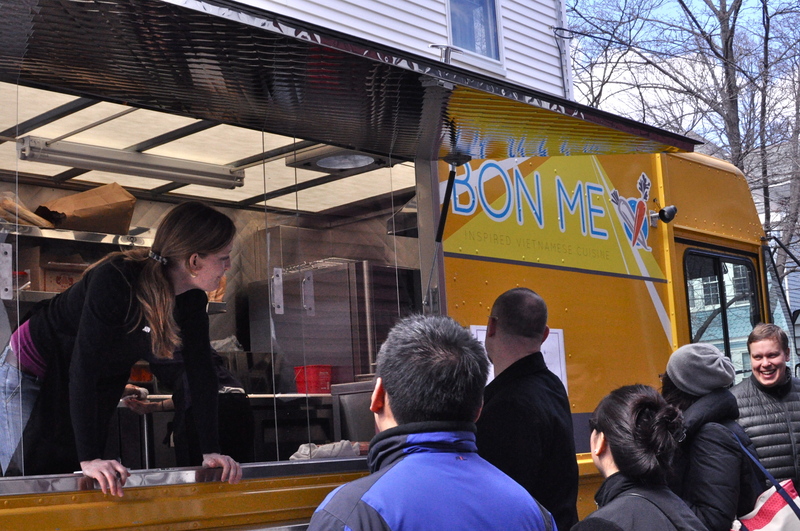 This past weekend I had the privilege to spend some time with Asta Schuette, Alison Fong and Patrick Lynch, owners of Bon Me and one of three finalists from Boston’s Food Truck Challenge last October. Below is a brief write-up I did on their business: look for them next Monday serving up “inspired Vietnamse cuisine” near the Government Center stop on the green line. 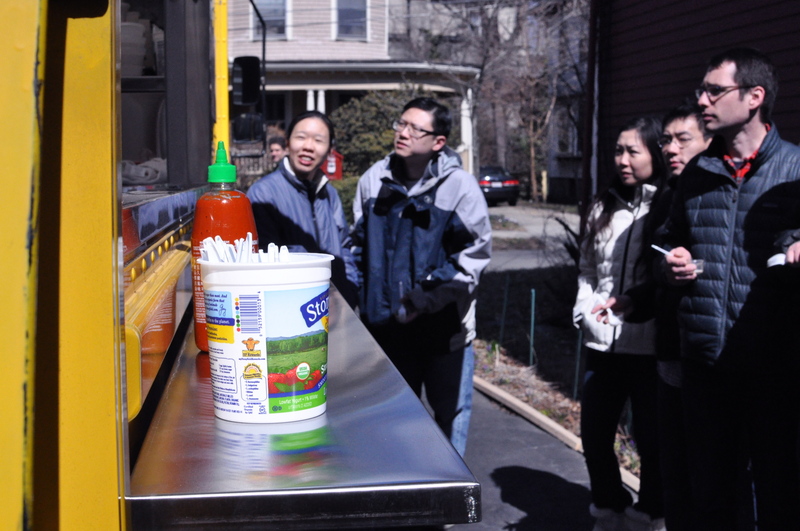 On April 4th, Asta, along with her partners Ali Fong and Patrick Lynch, will officially open their food truck for business in City Hall Plaza, across the street from Boston’s famed Faneuil Hall. Today is a unique celebration for Bon Me held at Patrick’s mothers’ house; and the eager trio of entrepreneurs are serving family and friends Bon Me’s first batch of, well, bahn mi. Other than the price tag, offerings today mimic the soon-to-be menu: a choice of the the bon me sandwich ($5), rice bowl ($6), or salad ($6); filled with grilled pork, satay chicken, or bbq tofu, topped with tangy carrot and daikon pickles, cilantro, cucumber and their secret Bon Me sauce. Thanks so much for coming out! 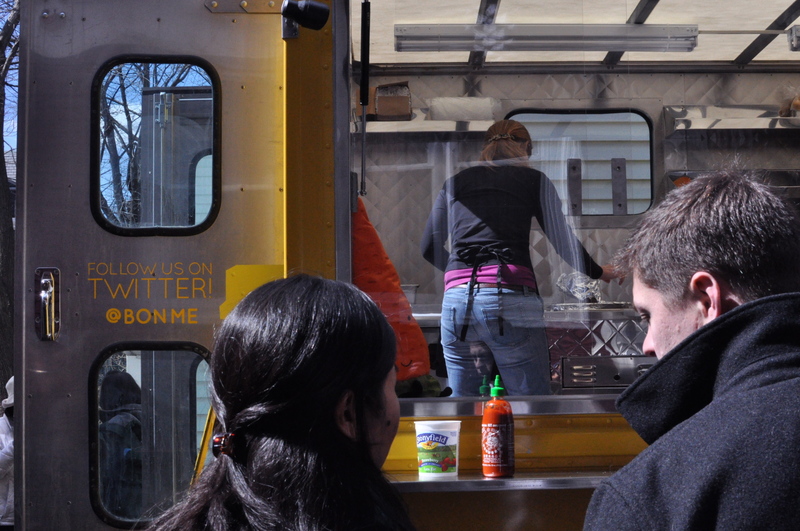 Although it was cold I think people enjoyed their food in the warm glow of the sunshiny truck.